According to the U.S. Department of Education, 73 percent of female undergraduates with children do not attain a degree or certificate within six years of enrollment. I am a mother, and I will beat the 73 percent statistic. I will graduate college. I will be successful. I will thrive. 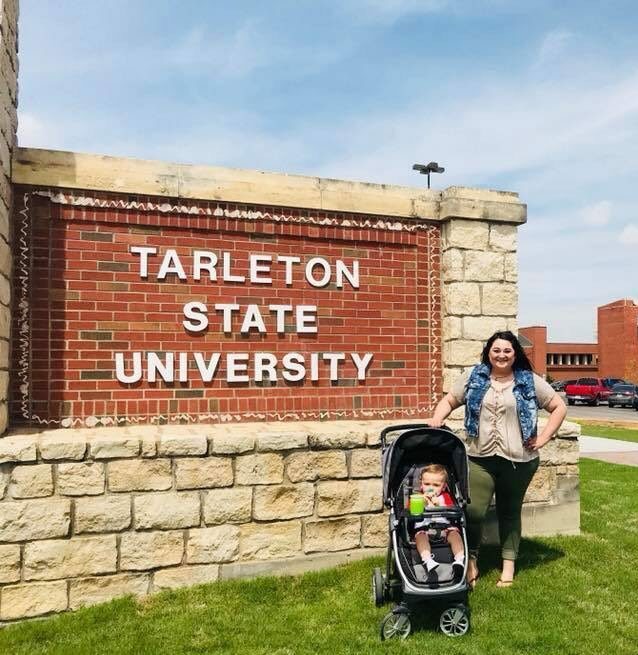 Two years prior to having my son, Axel, I attended Tarleton State University, but couldn’t maintain grades while living a toxic lifestyle. I abused prescription medications, illegal drugs and depended on alcohol to enhance a life I didn’t want to live. A month after becoming pregnant, my child’s father left abruptly. I was working at McDonald’s, we had an apartment together and I was left broken and scared. I was clueless about how life would be with a tiny human depending on me. Nine long months later, I gave birth via Cesarean section – which alone changed my life. At the time, I never had surgery or even a broken bone. Also, the pain medication wasn’t effective throughout the entire surgery, and a scalpel was lost in the operating room – making for painful X-rays while being flipped from side to side. Giving birth is an experience any woman would call their “greatest high”. After seeing my son for the first time, smelling his hair and feeling his skin, I realized the path I was on and I wanted to be better. After I externally healed from surgery, Axel was about three-months-old. Seeing him grow and change spoke to me. I decided my life needed a boost, so I enrolled in classes again at Tarleton for the 2017 fall semester. During the first half of my first semester as a mom, I couldn’t afford daycare. This meant doing homework late at night while my child slept, and many nights of no sleep because he was sick frequently. Most of our meals come from food stamps, Temporary Assistance for Needy Families (TANF) and help from family. Without this assistance, I wouldn’t have been able to make it through these last couple of semesters – or change my son’s diapers. 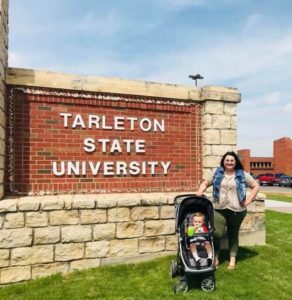 Balancing grades, work and motherhood was the most stressful thing for me during my first semester back in two years. I live 70 miles away from Stephenville, which meant waking up at 4:30 a.m. every other day to arrive on time for my 8:00 a.m. class. I was enrolled full-time, made the Dean’s List and reported for The Breckenridge American, the local newspaper where I live– all while raising my son. To this day, my child’s father has zero contact with my son, but not by choice. I made effort to gain paternity for my child, but my efforts weren’t enough. I still maintain good grades, and now currently work for the Texan News Service as Sports Editor. I thrive every day as a mother and do everything for my son. Axel turns my world around and I wouldn’t change anything about my life, because it’s made me who I am today. Being a college student is hard. Balancing schoolwork, a job and a baby is even harder. What sets me apart from other moms is a support system. My family and friends help tremendously so I can achieve my goals. Without them, I wouldn’t have accomplished any of the things I did in the last year. Some mothers have it harder than I do. Some mothers leave the hospital not only without a partner, but without anyone. Some mothers sacrifice meals to feed their children, and literally cloth diaper their babies with the clothes on their back. These mothers will have a harder time beating the 73 percent statistic. I am blessed to have the things I do, but I won’t knock myself for the amount of work it takes to be a single mom in college. However, I will say I can’t imagine how difficult it must be to be in the same position without support. When I think about the “single college mom” statistic, I get emotional. But it drives me to want to succeed even more and work with passion to achieve my goals. I refuse to let the 73 percent statistic win. « Older Article Opinion: Should the Confederate monuments come down?